EVANSTON, IL. Although the afternoon included torrential rain, thunderstorms and weather delays, it ended in rainbows and happiness ... for Force fans. In the fourth quarter of the Force's dominating win, a spectacular double rainbow appeared to the east of the field, the perfect culmination to a resounding triumph over arch rival Kansas City. It was expected to be a bitter battle between undefeated powerhouse teams, but after KC scored the game's first touchdown, the relentless Chicago squad scored 51 unanswered points. Both offenses struggled early in the game, as neither team was able to mount drives on their first three possessions. Late in the first quarter the Titans scored suddenly on a short pass completion to Liz Sowers, who came off the line untouched and went 56 yards to the end zone. The point after kick was good and KC led 7-0 with 1:57 remaining in the first quarter. The score seemed the shock the Force offense out of their funk as they began to systematically move the ball downfield on a series of running plays, keeping the ball on the ground as the rain intensified. A weather delay caused by lightning put both teams and fans under the stadium for cover for almost an hour. When the game resumed it was fourth and one for the Force in what became a turning point in the game. Force QB Sami Grisafe converted for a first down on a sneak to end the first quarter. The next set of downs culminated with the Force on the KC eight yard line facing a 4th down and 6 situation. Grisafe rolled out and scanned her receivers, but decided to keep it and scored easily. Running back Darcy Leslie got the handoff and scored for the two point conversion to put Chicago ahead 8-7. The kickoff went out of bounds, giving the Titans the ball at their own 35 yard line. KC was unable to move the chains and had to punt. On third down Grisafe found wide receiver Jeanette Gray on a slant pass and she weaved through the defense for a 50 yard gain all the way down to the KC 16 yard line. Two plays later running back Brandy Hatcher scored on an 8 yard carry. Leslie again converted on the two point attempt, giving Chicago a 16-7 lead. The Titans next possession went nowhere and they made the mistake of punting to Chicago's speedy returner Jessica Javelet, who fielded the ball at her own 30 and exploded down the sideline for a 70 yard touchdown. Leslie again punched in the two point conversion: Chicago 24, KC 7. It was déjà vu all over again as the Chicago kickoff went of bounds and again KC could not move the ball. Chicago took over on their own 33 yard line. After a first down, Grisafe again passed to Gray who sprinted through the secondary for a 52 yard touchdown. Once again it was Leslie on the successful two point conversion and Chicago led 32-7 lead over the stunned KC squad. On the first play of the Titans next possession, the ball carrier fumbled and it was recovered by Chicago's defensive game day MVP Kim Marks. Chicago scored again on a jet motion handoff to Javelet for a 30 yard touchdown. Chicago failed on the two point attempt, but extended the lead to 38-7. 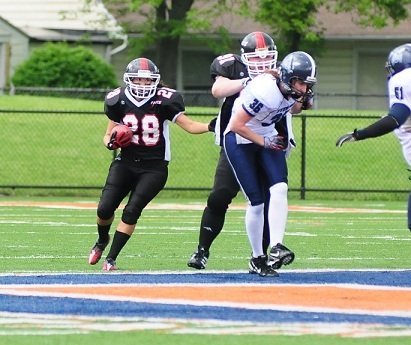 The Titan's first possession of the second half looked promising until Chicago's Jamie Menzyk burst into the backfield and sacked Titan QB Jenny Schmidt. Schmidt fumbled as she was hit and Leslie scooped up the ball and returned it 51 yards to the KC 26 yard line. Although Chicago continued to put together long drives, they did not score again until midway through the fourth quarter when Javelet scored on a 36 yard end around. Grisafe's pass on the two point attempt was incomplete. Chicago 44, KC 7. Chicago scored again at the end of the fourth quarter on an 85 yard pass completion to Javelet, with Tricia Charbonneau kicking the extra point for the final margin of victory 51-7. Javelet finished with 248 all-purpose yards and 4 touchdowns and was named the offensive game day MVP. The Force offense had 466 total yards - 247 yards on the ground and 219 in the air. The Force defense spent considerable time in the Titan backfield and KC only managed 125 total yards of offense (90 passing, 35 rushing). Darcy Leslie had 11 tackles, a sack, a fumble recovery and forced two fumbles. Defensive end Angel Smith had another monster game with 8 tackles, 4 for a loss, and 2 sacks. And Jen Dulski continues to create problems for opposing offenses with her jarring hits and relentless pursuit. The Force finish out the regular season Saturday June 8th vs. West Michigan Mayhem at 5pm at Evanston High School's Lazier Field. By winning their division, the Force has earned a bye for the first round of playoffs as well as hosting rights for the second round on Saturday June 22nd. Continued hosting rights will be determined by outcome of previous rounds.